Choosing the right way to remember a loved one is not a decision to be rushed into. A memorial should create a long-lasting focal point that can be visited by future generations. That’s why it is so important to consider the best material to use for a plaque, monument or gravestone memorial. Of course, a design must be aesthetically pleasing and a fitting tribute to the deceased, but practically speaking it must also be able to stand the test of time for years to come. 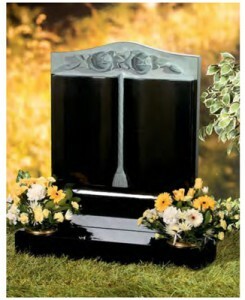 Upright memorials are commonly in headstones and are typically fixed to the ground using a solid base. Popular materials used for this type of headstone include granite and marble. However, there are other types of memorials and headstones. Flat markers – often made from granite or bronze – are placed flat to the ground, although some can be positioned at a slight angle. Meanwhile, kerbed headstones feature a complete line around a grave plot, forming an enclosed rectangle. Again, friends and family have a choice when it comes to what materials are used for a kerbed headstone. Opting for a particular type of material will undoubtedly affect the overall ‘look’ and visual properties of a memorial. However, durability is also a key factor. Granite is a popular choice precisely for that reason. It is able to withstand all weathers, is resilient and is available in a wide choice of colours. Some locations may only accept granite headstones in order to maintain a sense of cohesion across the whole cemetery – which is why we would always advise checking with cemetery management before making a decision about a memorial. An alternative might be Portland stone – which is grey in colour and creates a weathered effect over time. Bronze is another material which is favoured for its durable qualities. It does not need too much looking after and will get darker over the years so ages extremely well. Other popular premium materials for headstones include marble, slate and sandstone. At Davis Memorials we have material samples available for you to review. It often comes down to family members and close friends discussing preferences that match budget and the needs of their lost loved one. If you would like to ask a question about choosing the right material for a memorial or headstone, simply complete our contact form or call 01384 566 958.